One of the advantages of using SSRS as a client for SSAS is the control you have over your MDX, and one of the advantages of control over your MDX is the ability to parameterise not only your queries but also any calculations defined in those queries. It would be great if we could parameterise calculations defined in the MDX Script (I have a Connect open on this, in fact – please vote!) but until we can, we can do something almost as good: we can use a dimension hierarchy to store a pre-defined range of parameter values and then use the CurrentMember on this hierarchy to pass one of these values to a calculation or dynamic named set. Here’s how. We can then build an SSAS dimension – I called it [Parameter Values] – with a single attribute, its KeyColumn property using the ParamID column above, its NameColumn property using the ParamDesc column, and its ValueColumn property using the ParamValue column. This means we have a simple hierarchy with four members on it. We then add the new dimension to the Adventure Works cube; it doesn’t need to have any relationship with any measure group. What I’m doing here is scoping on Internet Sales Amount and all of the members except the All Member on my new dimension, so that I’m only doing my calculation when a selection is made on the Parameter Values hierarchy. 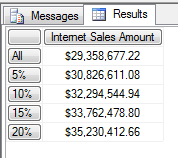 In this scope I’m then multiplying the value of Internet Sales Amount at the All Member with the value returned by the MemberValue function for the CurrentMember on [Parameter Values]. [Parameter Values] – which is the value from the column I used in the ValueColumn property of the attribute. Even though I’m scoping on a real measure, the calculation doesn’t aggregate up to the All Member because this dimension has no relationship with the measure group that Internet Sales Amount is from (or indeed any other measure group). …returns the top 5% of Customers (I’m using the MemberValue function minus 1, multiplied by 100, here so I can use the value 5 rather than the original MemberValue of 1.05) by Internet Sales Amount, which results in the top 164 Customers being returned. Slicing by the other members on Parameter Values will give me the top 10%, 15% and 20% of Customers by Internet Sales Amount. perfect for my case!!! Thanks chris! Is there a way to use the IIF within the set to determine the dimension members referenced. For example, swapping/toggling dimensions. example: IIF([DimParam].[ParamValue]. [ParamValue].currentmember is 1, [created date].[date]. [date].members, [closed date].[date].[date].members). So the IIF drives the dimension parent hierachy rather than just the number or members within a single dimension hierachy. I often get asked to create a ‘shell’ dimension that can roleplay as either one date or another based on a filter selection. Much like a case statement referencing multiple dims would do in the presentation layer — however Tableau has shut off these calculations when connecting to SSAS cubes so there is a need to create this dynamic dimension toggling in MDX if possible. Any ideas/advice welcome but loving the IIF in a dynamic set idea.